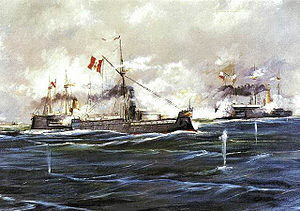 The Battle of Angamos Day falls on October 8th each year and commemorates the sea battle fought between the Navies of Chile and Peru on October 8th, 1879. People celebrate this day by attending military parades that honor Admiral Miguel Grau as well as attending other civilian parades. October 8, 1879 was the date of the naval battle of the War of the Pacific just off the coast of what was then Bolivia but now Chile between the Chilean navy and the Peruvian navy. In the end the Chilean navy won but in the battle Admiral Grau fighting for Peru became an important name in Peru because of his bravery in the battle.